I’m celebrating a milestone on Facebook. But more than that I want you to know that I am grateful that you come here with your cloth diaper questions. I am grateful you take the time to read what I have to say. I can’t wait to see what next year holds! I am going to keep this simple. I have a Smart Bottoms Rainbow Love cover to giveaway. Rainbows are the magic after a storm. And they are just plain pretty. Comment here with anything you want. Like and Comment on my Facebook Post. Click here to get there! Bonus if you follow by email! Sign up here! Open Worldwide. US/CA Shipping included. International winner responsible for additional shipping charges. Closes 1/2 11:59 pm est. How can you talk about cloth diapers for NINE years!? This is gorgeous! Thank you so much!! Commented and subscribed! I would love to win!!! Thank you so much for such a gorgeous diaper and an amazing opportunity to win one! Oh! I love this print! I can’t Remember doing this part of the giveaqay. It’s a beautiful diaper. Thank you for the chance to win. Would love this for my rainbow baby, thanks! We’d love to add this to our stash! Would love to win and try these! So cute! I would love to win!! Thanks for the opportunity ? Entered on Facebook. What a gorgeous pattern! ? I liked the recent post about CD laundry. I keep reading so many things and it gets confusing! Wow that was a lot of entries to scroll through. I would so love to win these beautiful diapers for my first baby due in a few weeks. I am committed to cloth diapering but it’s just such a big investment! This would really help. This would be great! We truly love & need this ? Congrats! Hope this new year brings you even more success! Thanks for your hard work! Love this diaper! Congrats on 50k followers! I’m still using disposable diapers but I would really like to try cloth! Entered, waiting on the WIN! Would love the chance to win this diaper for my newborn to be any day now! Congratulations on the success and thanks for the opportunity! Congratulations on hitting 50k followers! My baby is coming on Wednesday! I’d love to win some new diapers for her. Would love to win !!! I have liked and commented !!! Liked, commented and shared on FB also! We would love to try a SB cover! Would love to when this rainbow for my rainbow baby!! ? We don’t have any smart bottoms or rainbows in our stash yet. Thanks for this awesome giveaway! I liked and commented on Facebook! Fingers crossed that I win! That would be so exciting! I’d love to put this on my rainbow baby who is due in March! What an incredibly thoughtful and generous giveaway! I would be so truly appreciative if I happened to win! Thank you for this opportunity! ? Love this! So excited to try cloth diapering for the first time with my third lil bean. Would love to win! Very interested in starting cloth diaper. What a perfect giveaway ! I entered the giveaway, I’d love to win this pretty diaper! I’ve been wanting this diaper for awhile! Entered! I had my rainbow baby in 2015! We love smart bottoms ?? Would love to have this diaper! Entered! I’ve been wanting to try smart bottoms! Thanks for the giveaway! I would love to add this diaper to our collection for my children ?? Just liked your giveaway on FB and now I’ll be following your blog. I’ve been wanting to start using cloth diapers since learning more. Can’t wait to start! Would love to win this for my rainbow baby arriving in May! I would love this for myrainbow babies! This is absolutely gorgeous!!!! I entered and I’m crossing every extremity I have!!! Entered and love these colors!!! Thanks for the chance ? Would love to win this and gift it to a well deserving momma of three beautiful girls. Thanks for the opportunity! Love all the advice you give as well!! What a beauty. Thanks for the chance to win. I really want to try one of these. Liked and commented on FB as well. I love all the giveaways. Believing to win this! Would love to put this on my sweet baby girl – our rainbow baby! New to Smart Bottoms, but its already love! Commented on Facebook! Hope to add this to my stash!! Would love a good quality cover!! I am so proud of my daughter and sister for using cloth diapers . It really is a lovely print. I love the design work here! Hope to win and happy new year!! This is such a gorgeous print!! These rainbow diapers are not only oh so beautiful and earth friendly. But also very educational for kids. I’d love to have one of these for my Rainbow baby! I hope I get it! I’d love to win!! Thanks so much! I need this for my rainbow baby ? I would love to win this for my rainbow baby on the way! So pretty! Entered on FB as well. This diaper is beautiful! I would love to add this to my stash. I’d love to try this diaper!!!! Love, love, LOVE the rainbow print!! Absolutely perfect for all the rainbow babies ? our little man especially would love to rock this rainbow!! thabk you for the opportunity AACD! Fingers & toes crossed! ? Love pattern! Commented and liked on FB! We love all things rainbow in my house! Such a cool giveaway, thanks! Love your giveaways!! Hope to win ?? Happy New Year beautiful! Thank you for all you do for this wonderful community. May this year be better than last! What an awesome giveaway! I love Rainbow Love! I looooove this diaper. Thank you for the chance to win! I love your site and blog – especially the giveaways! This is a beautiful print, I’d love it for my new twins who arrived on Dec 6! Rainbow Love is one of our favorite SmartBottoms! It’s so pretty! One can never have too many rainbows ? Would love to win this. Havent been able to afford to try a Smart Bottoms diaper yet and have heard wonderful things. With 3 in diapers we could always use a few more. Plus I would love to have a rainbow cover for our rainbow baby. Entered. Thank you so much!d I’m so in love with this diaper! This is an adorable diaper! Thanks for the chance to win. I love this! Smart bottoms are great especially their quality, and this print is perfectly gender neutral. Thanks for the great giveaway! Love this cover! Thanks for the contest! Would love this diaper! Happy New Year! 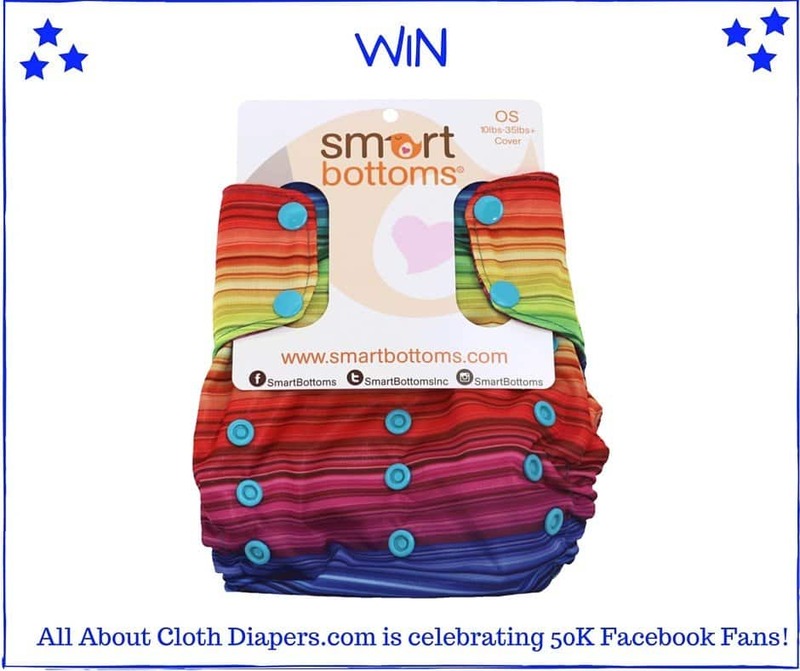 We love smart bottoms and would love to win one! I would love to win this! I followed all the steps to enter. Entered your fluffy bum contest ? Thank for this giveaway! Praying to win! Enter! ? happy new year! ? I would love to try Smart Bottoms! Thank you so much for the giveaway! Have a happy new year!!! I hope I win!!! 4th baby, but only 2nd in cloth due on March!!! Love this print and love this company. Would really love to try the new covers! Thank you for having this giveaway! Love smart bottoms! Thanks for the giveaway! I entered the contest! Thanks for the chance! I am so excited on cd’ing our first ever baby.. Awesome! Love Rainbow Love! Thank you for the chance! Love that you are so down to earth and love the site in general! Thank you! Always get your emails. Congratulations on your milestone. Look forward to many more in 2016. Of course we checked out your Facebook post, liked, shared and tagged. Of course we entered. Have been following you for a while. So cute, hope to win! Liked, commented, and shared facebook post! Soooo cute! I hope I win!! I just found your page today. So excited about this giveaway. entered! thank you so much for the chance! love this print so much!! wow so many people have commented, I love this diaper and I think it’s so exciting that when you order it you don’t know exactly what placement you’re going to have, in terms of colors so I would love to win one to see what I get for my baby boy!! Entered the giveway! Love it! Thanks for the opportunity! Thank you so much for this opportunity! This would be so fun to win! I’d love to have this for my babies!! Did all steps, thanks for the opportunity! Love this blog! I entered. Thank you so so much! Totally entered for the giveaway on Facebook. I Love it! I love this print and the blog! ? Thanks for the chance to win… Want this for my daughter she wants to do cloth but is scared it wont work for keeping dry.. Such a cute diaper!!! I love the colors. Thanks for the giveaway! Entered on Facebook and already on the email list. Thank you!! We love SB covers!! Thank you for the opportunity Jennifer. You have been doing a fabulous job wit all the giveaways, especially during the holidays. I entered on Facebook as well. I love this rainbow diaper! Entered on FB. Thanks for the great giveaway! Eek! I would love this for my next squish due in August!! ??????? I love this diaper! Thanks for the giveaway! Thanks for another amazing giveaway! I entered on Facebook. I have entered on All About Cloth Diapers FB page. Thanks for the chance at a pretty rainbow and congrats on your 50K FB fans and many more to come as cloth goes mainstream. I love Smart Bottoms and this print! Thanks for the giveaway! Its a pretty diaper. Love this print! Hope I win. My daughter would have a rainbow bright bum in this! Thanks for the chance to win this beautiful rainbow! Entered on fb as well! Thanks so much for doing these giveaways! I really like this one! Lovely diaper! Thanks for the chance to win!? Your blog has been my bible ever since I started CDing. Thank you for everything. I did all 3 and the bonus. Fabulous giveaway, as usual! Many thanks to you and your sponsors ? Would love to try Smarg Bottoms and on my rainbow baby no less ? This is the most beautiful nappy I have seen. My rainbow baby would totally rock this! I have entered all over ? I love this diaper for my rainbow babies! Wow this is an amazing prize! Fingers crossed I win ? I entered and tagged friends! I so totally entered for this!!! Love this diaper and would love to win!??? Firstly congratulations on the milestone! Secondly thank you so so much for everything you do for the cloth diapering community. Your blog, page and group are invaluable resources. Rainbows are particularly dear to me. With my first daughter it stormed throughout my labor, there were tornado warnings and we thought we’d have to be moved to safety. Luckily things cleared up as soon as she was born and a magnificent rainbow showed up outside my window. I’m currently pregnant with my second daughter. A couple years ago I was diagnosed with cancer and my doctors told me if I ever wished to conceive again I would need to freeze my eggs prior to chemo treatment. I had lost all hope and then discovered we were expecting. Really would love to win! Thank you for the giveaway! I entered on FB. I would love to put this on my rainbow baby! He’ll rock it! What an awesome prize, thank you for the chance! I love this rainbow diaper! Would love to put it on our rainbow baby, a little girl due any day now ?? I hope we win this pretty diaper and thank you so much for the opportunity to enter ??? What a beautiful rainbow diaper cover, the prettiest that I have seen in my opinion. I would love to win. Thank you for the chance. This print is so pretty. OMG such a cute diaper. Would be so great to win this. Did all the entries on FB and joined the mailing list. So excited! I would love to try a smart bottoms diaper and this one is gorgeous. What a cute diaper! Thanks for the chance! This is very pretty. I entered. Thank you. Thanks for doing this! Can’t wait until the winner is announced! Love the colors! :) Thanks for the chance to win! Love this! Can’t wait until the winner is announced! No Whammies! I want to win! I really want to try smart bottoms, and I love this diaper! Thanks for the opportunity! I would love to win this cloth diaper!! I have started becoming more interested in cloth diapers but I’m really not too sure where to begin. Winning this diaper may give me a place to start! Such a pretty diaper, and I want to try a Smart Bottoms soooo bad! Such beautiful colors! I’d love to see this on my baby. ? Would love to win this for my son. He’s my third boy and the poor thing has nothing but hand me downs! Love the blog posts. I’ve learned so much from this website. I love this site! Everytime I have a diaper related question, I can always do a search and find my answer. Thank you so much for all of the wonderful info in one place! I could really use a third cover for our stash, it’s hard only having two! Leaving a comment here and on Facebook, signing up for email as well! Great giveaway! Would love to try this brand. This is an awesome cover. I love rainbows! Good luck to all that entered! Baby #4 would look awesome in this cute diaper! I love rainbows. I always make a wish when ever I see one. This diaper is so cute! Congrats, and thanks for all you do for the cloth community! I have the perfect friend in mind to gift this to. She could use some rainbows during her storm! Awesome!! Yes, I need to win!! Love this diaper, so nice of you share it with others! Liked and commented on Facebook. I already receive your awesome newsletter and look forward to many more! Beautiful cover! It is just fabulous that you’re able to offer all these great giveaways because of all your wonderful sponsors!!! <3 my sponsors are amazing. This one is just from me because I love the print and thought ny readers would as well. Most gorgeous rainbow dipe I’ve ever seen!! I also commented on Fb. Such a pretty rainbow diaper!! So in love with this diaper! I use you blog for all of my cloth diapering questions. It has been a huge help for me and my family. Thank you! Love your blog, mommy/kids/cloth diapering/laundry/life advice, and giveaways! Thanks for sharing with others. Congrats on your reaching your goal. Love this diaper! Thanks for the opportunity! I have been eying smart bottoms and would love to try them! Loving these giveaways!!! Thanks again for the opportunity! I entered the giveaway. Thanks. I have wanted this diaper ever since I saw it. I would love to have a rainbow diaper for my rainbow baby. I have been eyeing this diaper for awhile. It is on my wish list.
? rainbow love…so difficult to get this dipe.. I hope I win it here! Hey Thanks so much for the chance to try a smart bottoms! In my almost 1 year of cloth diapering I Have not been able to try smart bottoms yet and I would absolutely love to! I also commented and liked the FB post and I signed up for the email list(like last year?) lol thanks again! Perfect diaper for our rainbow baby!!!!!! What a wonderful print this is. Happy New Year! Love the colors of the rainbow cover. Joined the email list. We LOVE the rainbow print ???? This is so cute. I would love this for.my baby girl. We love rainbow SB! ? Entered from Facebook…. Tried to join your mailing list with my email and it said invalid email…. I swear it’s valid! Lol…..
Beautiful pattern I would love to win and see my lovely little lady in this. Try opening the page directly from an Internet browser like xhrome instead of facebook. That should solve the issue. Thanks! I would love to win this beauty! :) Thank you!!! This is sooooooo pretty! What’s not to love. It will look perfect on my little girl! Thank you for all your wonderful giveaways! Absolutely love the rainbow print! Thank you for doing this awesome giveaway! I am so grateful for all of the hard work that you put into this site (and the Facebook page, and the group page) to help all of us new, and even seasoned, cloth users learn about all of the awesome tips, tricks and advice there is out there! I would have been lost without you guys and probably would have given up! So I (and my son, lol) just want to say, Thank You!! Commented and liked also on FB, and joined the mailing list. It’s such a beautiful diaper. Would love to win it for our daughter. I am due with Baby 3 soon, it would be amazing to win! This is such a pretty & vibrant diaper! I’m a FTM & baby girl is due 2/20! I would love to add this to my stash! :) Have a happy new year! P.S. I commented I Facebook as well! P.S. I commented on Facebook as well! Beautiful! Hope i am am blessed with it. This is such a lovely print!! Thank you! I would love to try these covers. So pretty. Beautiful! I would love this for my rainbow baby!!! Thanks for the chance! I love this print – it is SO pretty!!! Thanks for such a cool giveaway! I commented on FB, as well! This is one of the more beautiful rainbow dipes I’ve seen. This is gorgeous! Thank you for the opportunity! Yes, please! I’d love this to be the first Smart Bottoms that I try! We use Best Bottom & Buttons exclusively right now. I’ve been wanting to try Smart Bottoms but have been afraid to become addicted to another brand too!!! One of my very favorites! Commenting here and on fb. This diaper is just <3! Would love to win it for my daughter! I would love to win this diaper so that I add it to my small diaper stash!!! Love love love this print !!! I love this print! Grateful for rainbow babies! Entered on fb (JamesandLindsay Martin), would love to win! I love this print, so pretty! Entered on Facebook! Love this rainbow! Prettiest diaper I have ever seen!! I love this! It would be a great gift to receive one of these for my Olivia! Making her a rainbow teething necklace & this cloth diaper will go perfect with it ? Omg, these are so pretty! Would look fabulous on my baby ;)! Thanks for the opportunity! Thank you for the opportunity to try and win. I would live to win this cute rainbow diaper cover. It will look so cute on the twin girls coming in April. I’ve been trying to enter the facebook giveaways for weeks but for some reason the only option I get is like and share. I cannot comment on any of the posts ?. I’m not sure. I have never heard of anyone else having an issue like that. Maybe it is your Facebook privacy settings? Commented here and fb. Fabulous giveaway! I commented on here and Facebook & I signed up for the emails!! :) I would love this beautiful diaper for my rainbow baby! Thank you for the opportunity. Cant miss the chance! Thank you! I commented here and on Facebook. I get the emails too! I’m so proud of myself and feel accomplished today! Thanks for that too! These giveaways are awesome! commented on FB. Wanted to say this is the best cloth diaper I have ever seen! Love the giveaways you do! Hopeful to win one! this is a beautiful diaper! Beautiful colors! Entered on Facebook, Thanks for Giveaway. Thank you for this chance! Love your blog and fb page! This is a beautiful diaper! I entered via fb. Wow love the print! would love to have one! I hope to win this lovely rainbow! Cute cover! Thanks for the chance to win. I’ve liked the post and the Facebook page, and left a comment. :) I’d sure love to win this beautiful cloth diaper! Rainbow love is so pretty! Thanks for the chance! I love Rainbow Love! I hope we get to try these out! Such a pretty diaper! I entered on Facebook too! I would love to win this diaper for my son who is due next april. Such a cute diaper. Thank you! Beautiful. Crossing my fingers :-) We’d love to try it out. These colours so work so beautifully together!! I sure must love my daughter and my granddaughter because I am constantly entering giveaways in hopes that I win so I can gift it to them ? BTW… you are awesome !!! Would love to win this diaper. My son would rock it well. Congrats on the followers! I know I am finding your information helpful in my cloth journey, started about 3-4 months ago. This diaper is so pretty! Love at first site!!! Happy new year! Thanks for the giveaway! Love this!! Would love one for my rainbow baby. It’s seriously one of my favorite prints. So beautiful! It’d be so fun to win it! ?I love this one! A rainbow for my rainbow ? Love all the colors in this diaper. I entered! Here’s hoping I’m the lucky winner! Hehe Love the rainbow print! Entered! Fingers crossed! Thanks for the chance! Thank you for all these awesome giveaways! I entered! Woohoo cloth diaper giveaway! This one is beautiful! ! I love this diaper! It’s my unicorn! Love this diaper! Entered on facebook! Liked and shared. Thanks for the chance to win! congratulations on 50k! I have liked, shared, and commented. I’m hoping for a rainbow baby to put this adorable rainbow on! ?? Drooling!!!!! I…lol…my son needs this!!!? This is such a pretty print, thanks for the chance to win! This is amazing! Rainbow Smart Bottom bum would be kind of the best thing ever! Love, love it. Entered! Thank you so much. Thank you for the opportunity to win this beautiful diaper! I would love to try it! Thanks for the opportunity to win this beautiful cloth diaper. I’ve been wanting to try this brand. What a great print too! I entered on Facebook. This diaper is gorgeous! ! My rainbow baby will love this rainbow diaper thanks for the chance to win! Entered on fb also! Love the Rainbow Love Cover. Happy New Year!!! Thanks for the awesome giveaways! Can’t wait to cloth diaper my second boy! Thank you for the giveaway! Entered on FB. I love this! I plan on selling a couple pockets just to get some more best bottoms! It’s such a beautiful piece! Thanks for sharing the love and hope I’ll be able to win this for my boy! Thank you for all your amazing giveaways! I love this rainbow nappy, it’s so bright and cheerful! Thank you for the amazing giveaways! Love this one! This diaper is so pretty! Thanks for the giveaway! Liked and commented on the fb post. I’m still waiting on my rainbow baby. Would love this for my rainbow baby!!! Would love to put this only rainbow baby!! I absolutely love rainbow love. It is my favorite diaper of all times. I have a smart bottoms AIO and love it. No covers though!! Thank you this is so exciting! We’d love to have this cover!! That is such a beautiful diaper!! Ahhhh!!! I would love to try one of the new SB covers out! Thanks so much!!! Thank you for the opportunity to win this beauty. Yay! Love your blog. Entering the giveaway. ? Thanks for the giveaway! I really like smart bottoms! Thank you for the chance to win this beautiful cover! Ahhh the rainbow is so pretty!! This cover is beautiful! I’m needing a new cover and thank you for this awesome opportunity to win this one! Thank you for this opportunity! Would love to try smart bottoms! I <3 the RL diaper! I entered on the FB post. Hope I win! Rainbow love is such a beautiful print and I do not have any smart bottoms but u would love to win this one! I love this diaper! Entered on Facebook and liked the page! Entered and hoping to win for my rainbows. I’m so glad to have lucked into as a resource via FB. I’m expecting our first in May and very excited to learn about cloth diapering. Of course, I’d also love to win ? I so love this diaper!~~~~ ? So cute! Would love to win this diaper. I enjoy cloth diapering! Love rainbow anything! Cloth diapers are our best friend since my LO is horribly allergic to sposies. Really wanting to try the covers and rainbow is so beautiful! Loving the giveaways! Thank you! I love it!!! Thanks for the chance! Beautiful diaper! Congrats on a big milestone! It’s super pretty! Thanks for the chance to win it! I love love love the rainbow Smart Bottoms!!! So pretty!!!!!!! Thanks for this awesome giveaway!!!! Would lovee this diaper for my baby boy! Super cute! Entered to win, we would love to add this to our stash. ? Looooove the rainbow! I don’t have anything so pretty in my hand-me-down stash! Entered! Thanks for the opportunity, and all that you do! Thank you for this chance. I need a rainbow diaper for my rainbow little girly. Her first bday is coming up and she will have arainbow party. So pretty! I would love to try out a SmartBottoms diaper! Thanks for another opportunity to win a great prize! Congratulations and Happy New Year! Thank you for this giveaway! I’ve also entered on Facebook! WOW! This cover is absolutely stunning! Thanks for sharing this with one of us! Entered! Thanks for the chance to win this gorgeous diaper! I need a rainbow diaper in my life!!! I love this cover and have entered the giveaway! Adorable print, so excited! And I joined the email list too! I would love to win this for my LO! I’m subscribed to the email, too! Smart Bottoms are some of the best diapers ever!!! I only have two, but they are my favorite! Natural fibers, great prints! Thank you for the chance! Love this diaper! Entered, commented, liked, and shared :) happy new year! I would love to try Smart Bottoms! What a wonderful give away! Entered! I would love to try a Smart Bottoms diaper! My rainbow baby is due in 2 days. Would love to add this to his stash. I would love to try Smart Bottoms!!!! Thank you so much for the opportunity! !